The agreement between Marbon Chemical and AMT Corp. to build cars was cancelled in late 1967 due to high cost of building the limited production vehicles. The selling price for a sporty car at that time was around $5,000, but it was costing AMT between $8,000 and $9,000 to build them. AMT could not take that kind of a loss on each car so the companies split and went their separate ways. Marbon still wanted to sell Cycolac bodies to someone, so they started beating the bushes for another customer. Eventually they hooked up with a kit car company called Sportsland Unlimited, a division of Allied Industries of Nebraska. 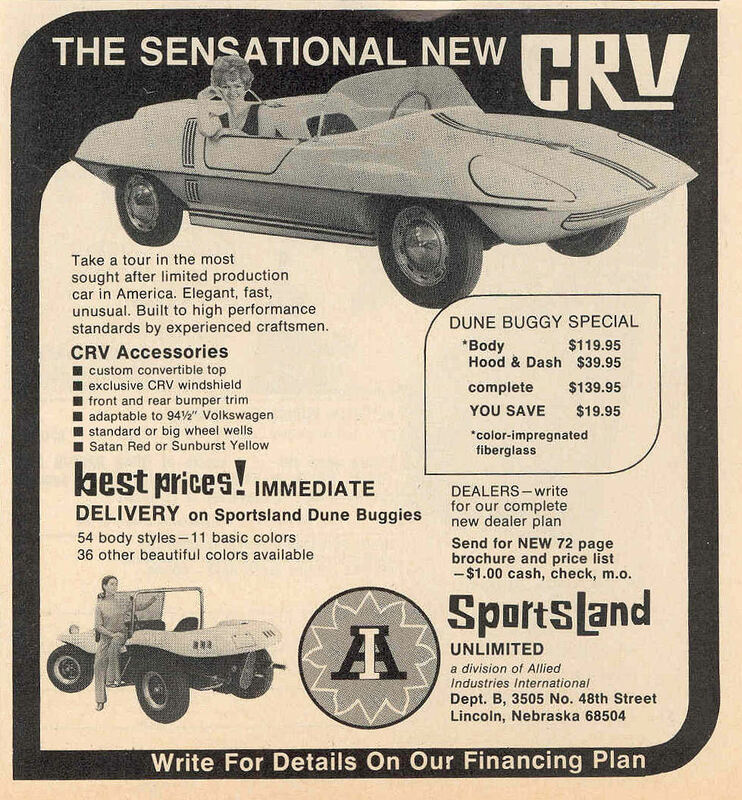 They offered dune buggies and other kit cars for the VW chassis. 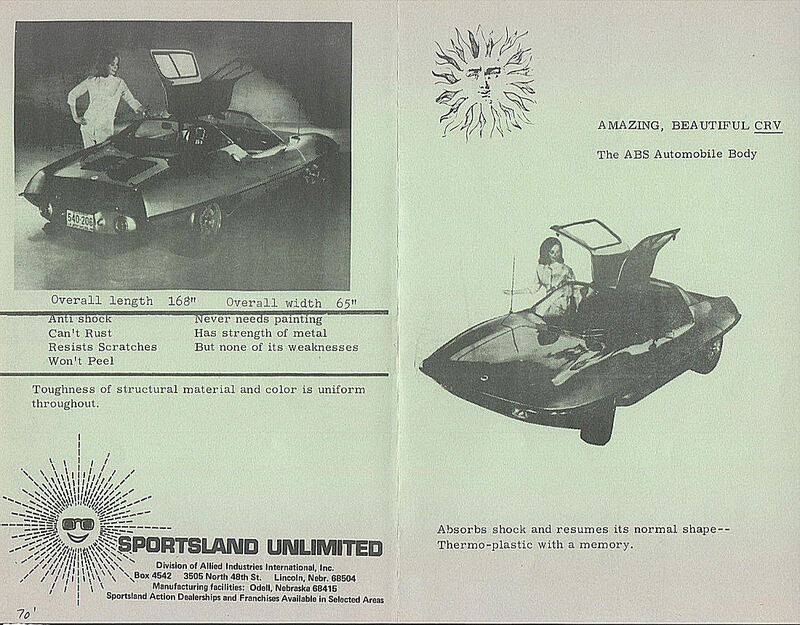 A deal was struck and Sportsland (and other divisions of Allied) started advertising an ABS plastic body called the CRV. Company ads used photos of the CRV-IV and CRV-V to promote the product. Later ads even used photos of the AMT Carbijal race car. Options included a windshield, roof, bumpers and seats. Like many of the items sold by kit car companies of the day, the photos were very misleading and many buyers were frustrated with what they got when the kits arrived: No opening doors, hood or trunk, a 90" wheelbase for a 94-1/2" chassis, and very incomplete instructions. Eric Curry built this CRV kit car in the late 1969 or 1970 with help from his dad. The body was Cycolac and has the original CRV shape. A bulge was added to the rear deck to clear the VW motor. Note how the rear wheels sit back too far because the VW chassis was too long for the CRV body without modification. Like many builders, the car was finished without doors or a front luggage compartment. From the few examples I have seen, it appears that the first bodies sold were thermoformed by Marbon from the original CRV molds without any changes. 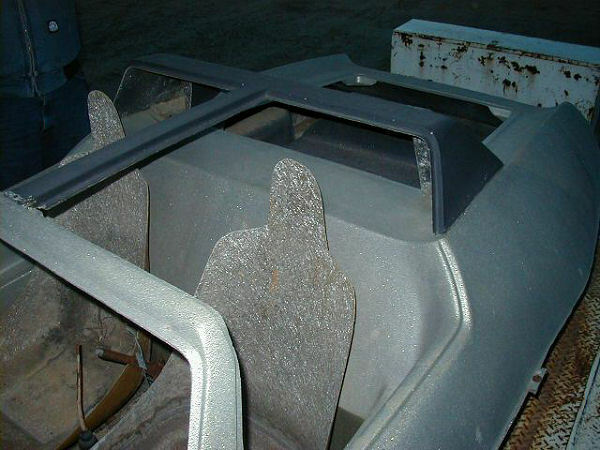 Sometime later, modifications were made to the molds to allow for a different windshield and a raised area on the rear deck to accommodate the taller VW engine. The lower half of the body was also modified along the rocker panels. Some Cycolac bodies were molded in this configuration. Eventually, Marbon ceased thermoforming the bodies all together and either loaned or sold Allied the original CRV body molds. The kit car company then made a fiberglass version of the original CRV halves that have no modifications to the body style. 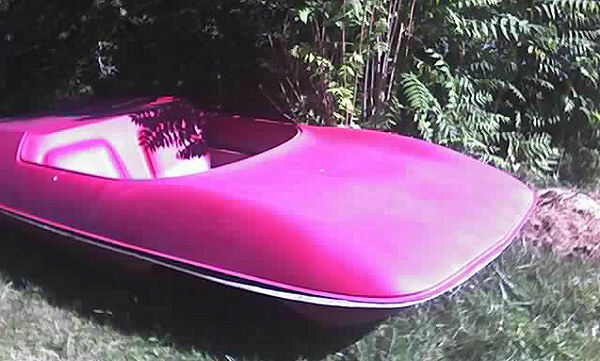 This untouched, fiberglass body was recently purchased in West Virginia. It has the original shape of the CRV with no modifications. 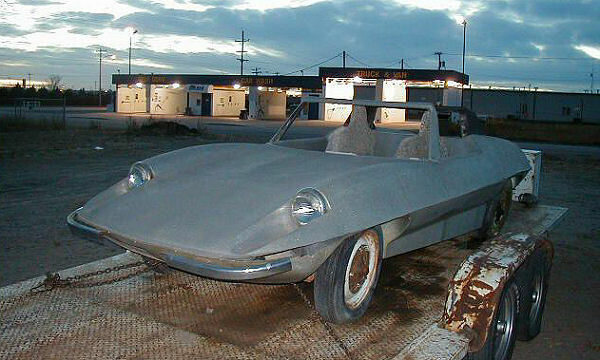 The owner is scratch building a metal space frame and mounting a Corvair engine in the car. Later, a drastically modified version of the CRV was released in fiberglass called the "Seagull." Changes included larger front fenders with headlights that were mounted farther back and cut into the fender tops, modified interior panels, and separate rectangular engine cover with a raised area for the VW engine, and a modified lower half. The bottom half had raised areas molded around VW suspension parts and a molded-in engine shroud. Here is a Seagull that was sold in Kansas several years ago. It has the optional seats and windshield frame/roof. Of the various survivors that have show up, the Seagull seems to be the most common. 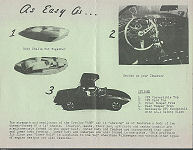 With its' optional roof panels, modified interior, optional seats, and opening engine lid, it was probably the easiest kit to complete. Eventually, Allied and its' various divisions relocated and evolved into Everett-Morrison which is now located in Texas where they build replica Shelby Cobras. When I contacted them about the CRV molds they responded that they were damaged during shipping and destroyed. Too bad. If you happened to be one of the many folks that owned one of these kits, I would love to hear from you and/or see some photos of your car. Please contact me at Nkw1965@aol.com.